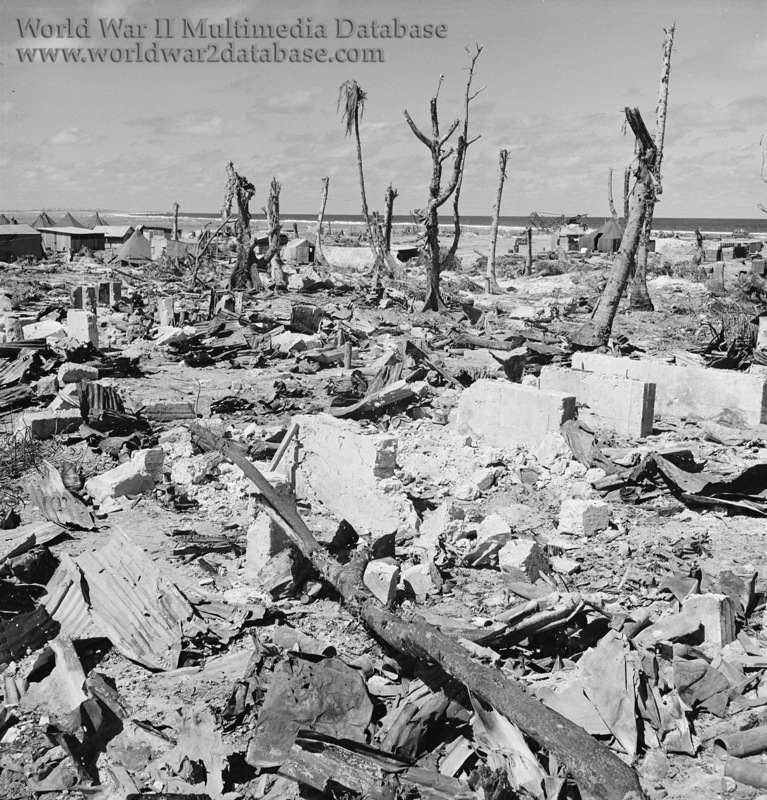 The preparatory bombardment of Kwajalein Island was unprecedented in the Pacific in both volume and effectiveness. During one period two shells per second were hitting specific targets or areas in the path of the assault troops. The 14-inch naval shells of the six battleships of Task Force 51 (TF 51) were most effective in piercing and destroying reinforced concrete structures. From the cruisers and destroyers, 8-inch and 5-inch shells ploughed into bunkers and tore up the thick growth of pandanus and palm trees. All together on February 1, 1944, almost 7,000 14-inch, 8-inch, and 5-inch shells were fired by supporting naval vessels at Kwajalein Island alone, and the bulk of these were expended against the main beaches before the landing. The field artillery on Carlson also joined in the preparatory fire. Its total ammunition expenditure on February 1 against Kwajalein was about 29,000 rounds. Finally, aerial bombardment added its bit to the pulverization of Kwajalein's defenses. At 0810 Hours six B-24 Liberators of the 392d Bomb Squadron based on Apamama reported on station. Between 0830 and 0910 they flew above the trajectory of the naval and artillery shells and dropped fifteen 1,000-pound and 2,000-pound bombs on the blockhouse and dual-purpose twin-mount guns at the northwestern end of Kwajalein. This was followed almost immediately by bombing and strafing attacks carried out by carrier-based aircraft. USS Enterprise (CV-10), USS Yorktown (CV-10), USS Belleau Wood (CVL-24), USS Manila Bay (CVE-61), USS Corregidor (CVE 58), and USS Coral Sea (CVE-57) sent eighteen dive bombers and fifteen torpedo bombers that struck the western part of Kwajalein Island while as many fighters strafed the area with machine guns and rockets. All together 96 sorties were flown from the carriers in support of the troop landing on Kwajalein Island. The results of all this expenditure of explosives were devastating. The damage was so intensive that it was impossible to determine the relative effectiveness of the three types of bombardment - naval, artillery, and air. The area inland of Red Beaches was reduced almost completely to rubble. Concrete emplacements were shattered, coconut trees smashed and flattened, the ground pock-marked with large craters, coral ripped to splinters. As the TF 51 report stated, "The entire island looked as if it had been picked up to 20,000 feet and then dropped."